Stay updated with Principal Real Estate Europe’s news and views. This press release has been written for informational purposes only and should not be considered as investment advice or as a recommendation of any particular security, strategy or investment product. 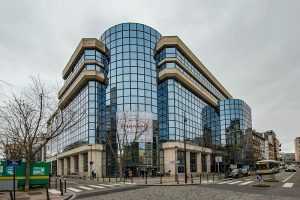 Principal Real Estate Europe, acting as asset and transaction manager of the Principal European Office Fund, has acquired Henkel’s French headquarters building from a fund managed by Primonial REIM. The nine-storey building comprises 8,110 sqm of lettable area, of which 7,600 sqm is let on a long-term lease to Henkel, the international chemical and consumer goods company, which was the building’s first occupier in 1994. In addition to the office space, there are 500 sqm of restaurant space on the ground floor and 193 car parking spaces. Built in 1992, the building is located on Rue de Silly 161 in Boulogne-Billancourt, a suburb southwest of Paris that is well served by public transport with excellent links to the city via the metro and several bus routes. Planned improvements to the local metro that are due to come into service in 2025 are set to significantly reduce journey times to other parts of the city. For example, it will take only eight minutes to reach La Défense, the largest office “town” in mainland Europe and home to the headquarters of numerous banks and insurance companies. Guillaume Masset, Head of Transactions and Asset Management in Europe, commented: “This is an office building with potential, let to a blue-chip tenant on a long-term lease and located in a promising suburb of Paris that is set to benefit from a large state-backed infrastructure investment project. It is exactly the sort of core asset we are targeting for the Principal European Office fund, providing stable income and potential capital value appreciation over the long-term”. The Principal European Office strategy is a balanced, geographically diversified office property strategy with long term value stability. The focus of the investment strategy is on first-class European properties in excellent locations. Ernst & Young, KL Gates, Duhamel Blimbaum AARPI undertook the structuring of the transaction for Principal Real Estate Europe. The legal firm Orrick Rambaud Martel was responsible for legal aspects and CBRE for technical due diligence. C&C Notaires advised Principal Real Estate Europe. Principal Real Estate Europe is part of Principal Financial Group’s dedicated real estate business, Principal Real Estate Investors, which manages or sub-advises $82 billion1 in real estate assets globally. The group’s real estate capabilities cover all four quadrants encompassing public and private, equity and debt investment solutions. In Europe, Principal Real Estate Europe operates from offices in London, Frankfurt, Amsterdam, Paris, Lisbon, Luxembourg, Madrid and Milan, employing more than 100 staff who manage real estate across all asset classes in nine different countries. Principal Real Estate Europe was formerly known as INTERNOS Global Investors, which was set up 10 years ago by Jos Short and Andrew Thornton, who continue to lead the business. Principal Global Investors2 is a diversified asset management organization and a member of the Principal Financial Group®, with expertise in equities, fixed income and real estate investments, as well as specialized overlay and advisory services. Principal Global Investors manages $430 billion in assets primarily for retirement plans and other institutional clients. 1As of June 30, 2018. AUM figure does not include Principal Real Estate Europe. 2Principal Global Investors leads global asset management at Principal® and includes the asset management operations of the following members of Principal®: Principal Global Investors, LLC; Principal Real Estate Investors, LLC; Principal Enterprise Capital, LLC; Spectrum Asset Management, Inc.; Post Advisory Group, LLC; Columbus Circle Investors; Morley Capital Management Inc.; Finisterre Capital, LLP; Origin Asset Management, LLP; Principal Global Investors (Europe) Limited; Principal Global Investors (Singapore) Ltd.; Principal Global Investors (Australia) Ltd.; Principal Global Investors (Japan) Ltd.; Principal Global Investors (Hong Kong) Ltd., and include assets where we provide model portfolios. Marketing assets under management include certain assets that are managed by Principal International and Retirement and Income Solutions divisions of Principal.